Hubby was insisting we plan our next trip- we were only able to take 2 days off across a weekend giving us 4 days in total. We went through travel websites and available holiday packages – picking the Maldives for our getaway. When you only have a few days and you’re going to a place like the Maldives you have to maximise your stay there, aka WATER BUNGALOWS. What seems like an unnecessary luxury while planning, the full-board water bungalow experience is worth every extra penny. Male city is not Maldives. There are coastal resorts and islands with resorts that are only accessible by water or air transport (that can vary between 20-90 minutes, subject to the weather). It’s an expensive destination and without flexible flight dates, booking your itinerary separately is probably better than a holiday package. Special mention to Sharma who made sure the kitchen catered to our every need. Hubby wanted butter chicken and I needed fresh ginger tea with every meal (got terribly sick before we left Dubai). I did manage to convince hubs to let me snorkel on the last day. Although I only had the courage to stay on top of the reef which was fairly shallow, being 90 minutes into sea meant a once in a life time experience of sea life. The view. It will never leave us. Male City, but you can read more about that here. The non-bungalow side of the island had a drop off in service quality and cleanliness. Service quality in general – if you are nit picky – lacked a certain amount of sophistication you would find in standard five-star quarters. But some would prefer it this way as it also makes you comfortable. Everything in the Maldives has a dollar price to it and is expensive. Account for an extra 20% minimum above and beyond your pre booked expense. For example, on average, resort water transfers are $200 per person and $400 per person via seaplane. 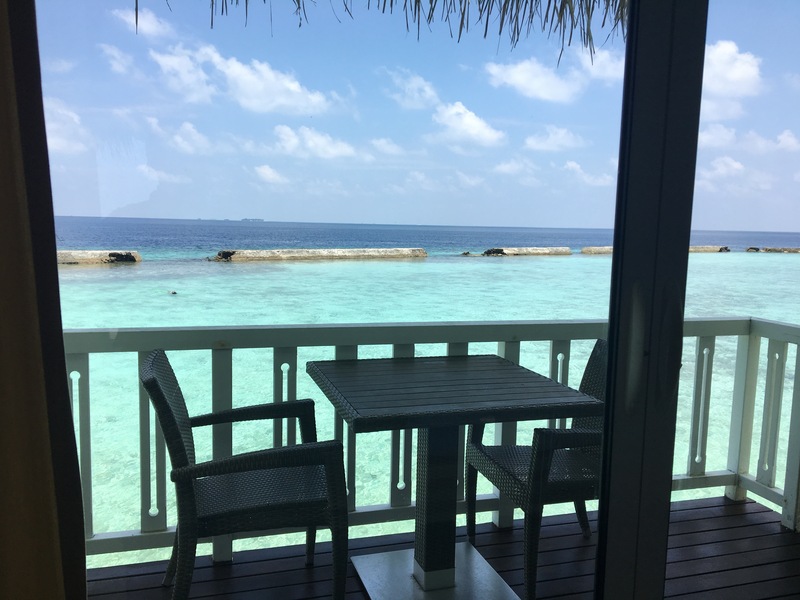 We spent AED 11,000 for a total of 3 nights and 4 days, including flights, our stay at Hulhumale, transfers, island stay, spa, snorkelling, medical consult/medication, and other miscellaneous expenses.